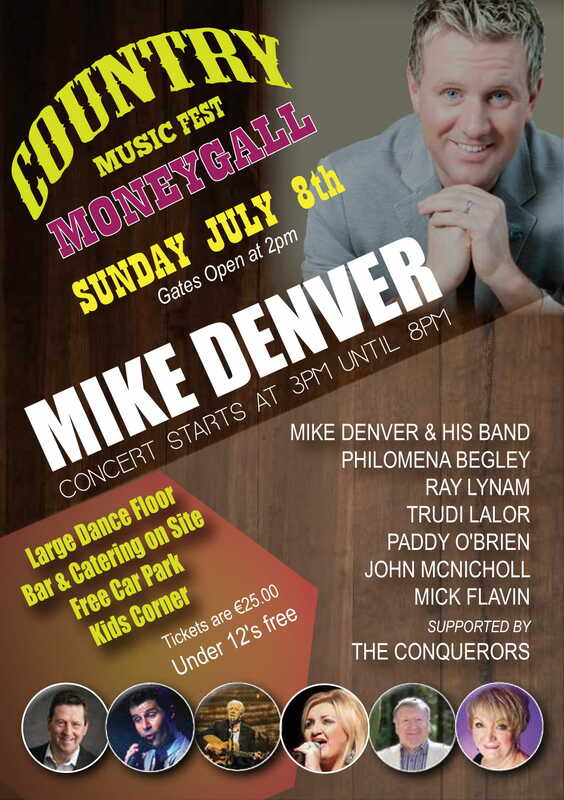 Moneygall will bring some of the biggest names of the Irish Country Music scene to the local GAA grounds on Sunday July 8th. This ideal setting for an afternoon of dance, song and entertainment will be headlined by Irish Country Music Awards 2018 Entertainer of the Year Mike Denver. Denver will perform for two hours along with his own band, and he guarantees an amazing show for all to enjoy. Mike will be performing hits from 2018 Album of the Year “Cut Loose” and from his new album including songs such as Hey God and Nancy Mulligan. The large dance floor will ensure you can bop till you drop and join in with a jive, waltz and even line dancing. The Queen of Country will also join the array of talent as Philomena Begley will be laying her blanket firmly on the ground when she entertains the audience in St Flannan’s Park. Coming from Co Tyrone to Moneygall has to be one of her Elusive Dreams as she will share the stage alongside her long time stage partner and friend Ray Lynam who will perform his own set and join Begley as he has done since 1975, out on stage to perform many of their classics. Longford entertainer Mick Flavin will also be making the trip to entertain us, as he performs some of his hits like “Someday You'll Love Me” and “I'm Gonna Make It After All”. This Country Music Fest is bringing the leading artists from around Ireland in the Country Music scene and this is evident as the Waterford native Paddy O Brien will perform hits such as Never Grow Old and Tipperary in my Dreams, Paddy has performed a duet on a few numbers previously with artist Philomena Begley so who knows we might see them pair up again on Sunday July 8th. One of 15 children John McNicholls has been performing from a young age in his native Co Derry. John will entertain the crowd while they soak up the atmosphere of the largest outdoor country music festival in South Offaly/North Tipperary in 2018. Our closest neighbour and leading Laois performer Trudi Lalor will complete the bill of artists who will all be supported by the Conquerors. Trudi is winner of Hot Country Female Vocalist of the Year 2018 and has been voted Female Entertainer of the Year Sky TV North Ireland Award and will grace our stage to “Keep on Keeping it Country” with a selection of her hits. The presenter and voice of Tipp FM’s Premier Country will also be joined on stage by American Country Music song writer and singer Max T Barnes. The organising committee have ensured everyone is catered for with Children under 12 accompanied by an adult gaining free entry and they can be entertained in the Kids Zone with large games and various activities. Catering, Bar and Confectionary will also be on site and there will be a number of seats set by the dancefloor for when your feet start to feel the pressure of the 5 hours of entertainment. There will also be a free car park for patrons adjacent to the GAA grounds and vehicles requiring disabled parking will be required to display a badge and will be permitted entry tp park on the grounds. The Saturday Night Show’s Kevin Lalor-Fitzpatrick from Midlands 103’s will perform MC duties on the day and with his leading country music show on Midlands Radio he definitely will bring entertainment and he surely has a bank of knowledge to share on each of our performers. Gates open from 2pm with entertainment commencing at 3pm but to keep up to date on all things Country Music Fest like our Facebook page www.facebook.com/countryt musicfestmoneygall.